Today’s IT environments are dynamic and in an almost constant state of flux. Modern storage has undergone a shift thanks to cloud providers such as Microsoft Azure and AWS. Data is moving across multiple platforms, increasingly a hybrid of traditional, virtual and cloud are creating different protocols and policies. These silo’s of information can no longer be secured, managed or moved easily as your data is dispersed across the network. Adopting a Data Fabric approach towards your data storage and management will remove such problems and allow more time for innovation and service delivery. You have options when it comes to where and how you procure IT services. 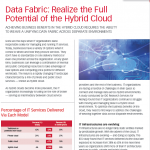 You’re in the era of the hybrid cloud, which is characterised by a mix of private and cloud services.